Beginner Whole Wheat Artisan Sourdough Bread is made with 100 percent WHITE whole wheat flour OR red wheat. Working with White Whole Wheat Flour is MUCH easier than the heavier whole wheat flours. 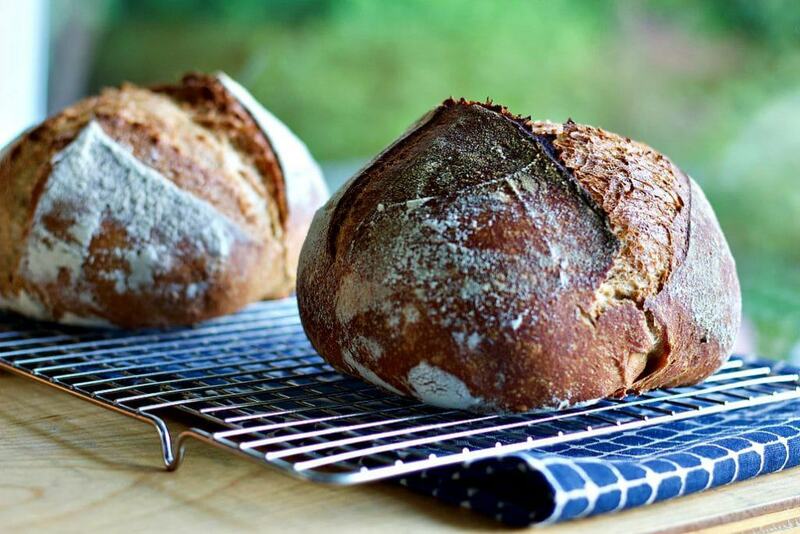 But it’s possible to have great success with baking whole grain sourdough bread using both. Most of this post refers to white whole wheat because it is easier to work with. This post is all about beginners getting positive results. However, You CAN have success with this recipe using freshly ground whole wheat berries. I ground the flour for this whole wheat loaf in my new KoMo Mio Grain mill (read our full review of this gorgeous mill here). I used a fine setting to mill the flour. It worked out beautifully. The loaf is soft and moist. Isn’t that crumb lovely? 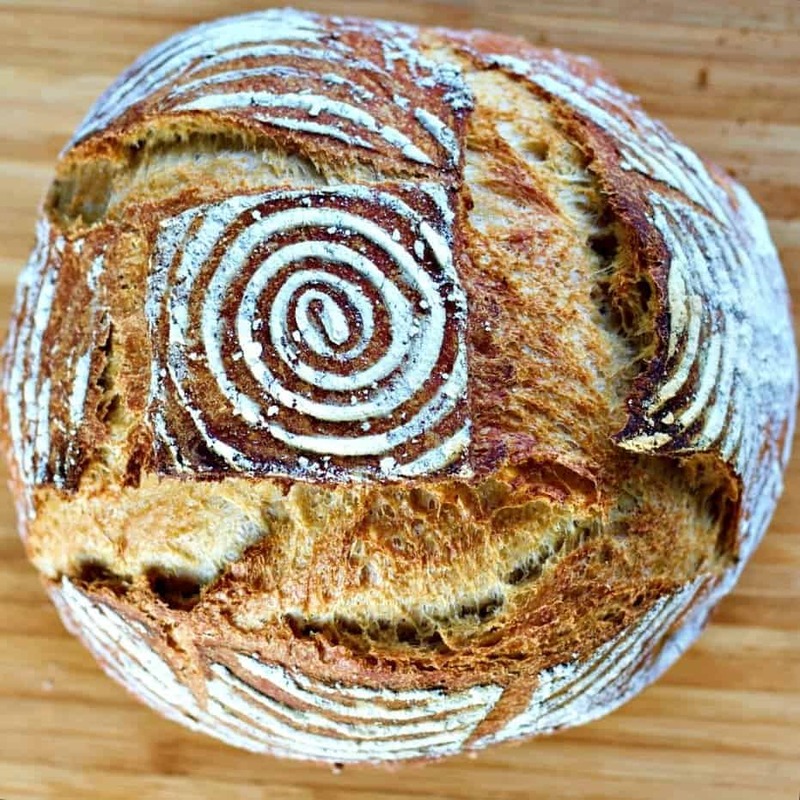 This post teaches a Tartine Style bread like our Homemade Food Junkie Sourdough tutorial Beginner Artisan Sourdough Bread Recipe . 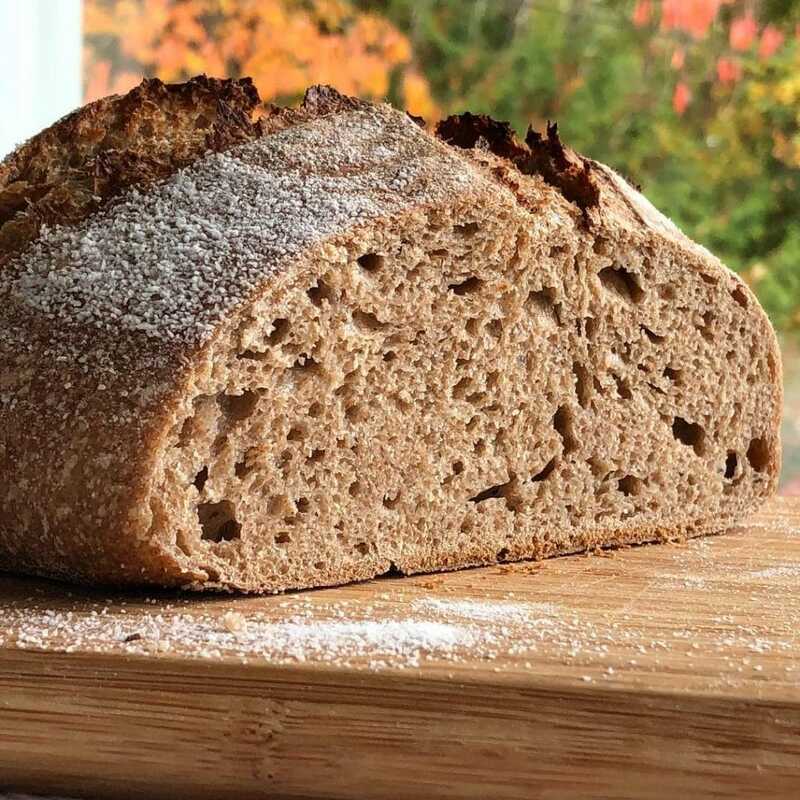 We have made adjustments to the recipe and method to help you have success with this whole wheat sourdough bread recipe. 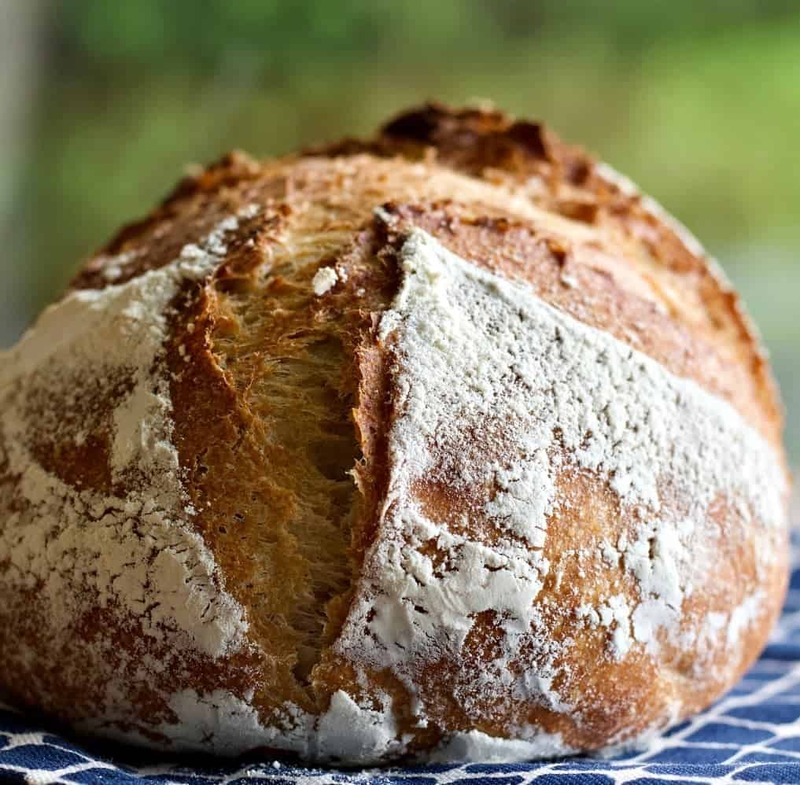 White whole wheat flour is a perfect healthy choice for this beginner’s artisan sourdough bread. White whole wheat is exactly like brown whole wheat nutritionally. We made a video of the ENTIRE process of making our Beginners Artisan Sourdough Bread for you. We compressed the 24 hours it takes to complete this recipe into about 6 minutes long. The video shows you the techniques used in this recipe (except slap and fold) and every step in order. BUT the video dough is NOT a whole wheat flour bread. 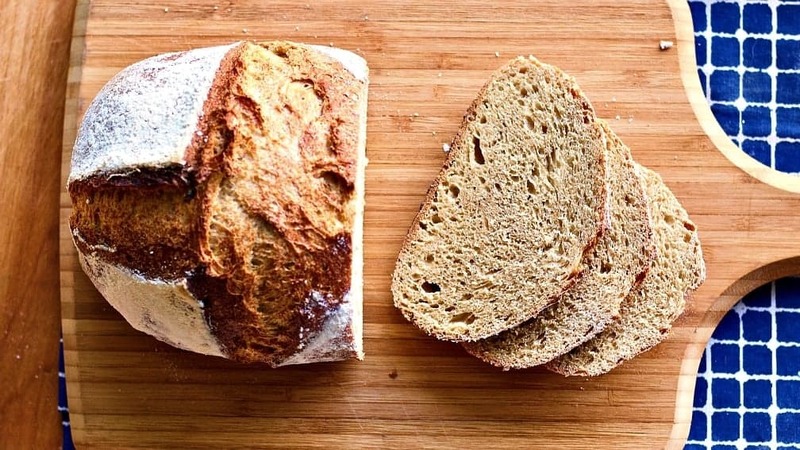 We give you extra tips in this post for working with whole wheat flours. Let us know in the comments if it helps you out. And Please subscribe to our youtube channel. Try our Milk and Honey Sourdough Sandwich bread. 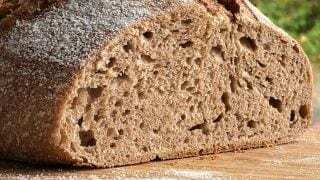 The crumb of white whole wheat bread is dense compared to a white flour but less dense than other whole wheat flours. 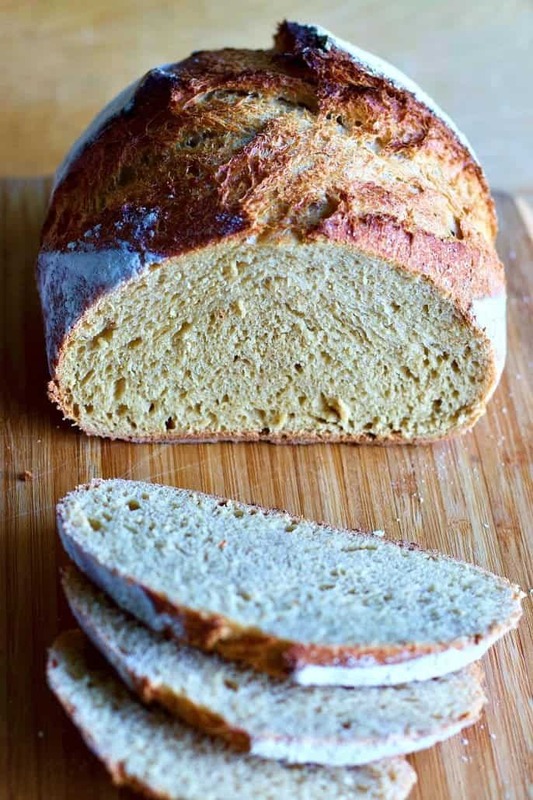 I use Montana Prairie Gold white whole wheat flour to lighten the loaf and give it a softer, moister crumb than a heavier whole wheat such as winter red wheat will produce. The flavor is outstanding! Beginner Whole Wheat Artisan Sourdough Bread made with white wheat flour. And the results speak for themselves. This white whole wheat loaf is beautiful with a nice amount of rise, moist flavorful crumb and it’s extremely nutritious. Sourdough whole wheat bread is Wonderfully nutritious and digestible. This is a great whole wheat sourdough sandwich bread. Just cut the large slices in half to keep the sandwich size manageable. Or make this recipe in bread pans. Even gluten sensitives can digest sourdough bread WAY more easily than commercial yeast raised breads. The fermenting process of sourdough actually helps to break down the gluten into more gut friendly food. What is WHITE whole wheat flour? White whole wheat flour is a variety of 100 percent whole wheat. Just like any other whole wheat flour it is grown from wheat berries and made into whole wheat flour. White whole wheat flour is Planted, grown and milled WITHOUT extra steps or additives. No bleaching or mixing in other flours. It is simply naturally lighter in texture making it easier to work with. And it’s full of the same nutrients Classic red wheat flour has. Happiness! Beginner Whole Wheat Artisan Sourdough Bread has a soft flavorful crumb. My family LOVES the flavor of this bread and it’s very nutritious too. White whole wheat flour makes baking with whole wheat flour easier. It’s about mid way between the lightness of all purpose bread flour and the heavier red winter wheat flours. I have made several batches of this whole grain sourdough bread recipe. The various loaves you see are the results. They all turned out great! Working with winter wheat whole wheat flour in a long rise sourdough bread is challenging. The heavier whole wheat flours (like Winter wheat) are stickier than all purpose white bread flours. They don’t develop gluten easily or raise as well as this 100 percent white whole wheat Sourdough bread. But they are still delicious. Beginner Whole Wheat Artisan Sourdough Bread made with 100 percent white whole wheat flour. Notice the lifted crust? That is called an ear and is produced by properly scoring your loaf to get the best rise. NOW we know why WHITE whole wheat flour is a good choice for this artisan sourdough bread. We know how to properly prepare your home milled flours for sourdough long rise bread baking. Let’s get started learning the method for this bread recipe. It’s REALLY VERY EASY. It just takes a long time. Beginner Whole Wheat Artisan Sourdough Bread recipe makes two loaves. This is one of the loaves I made with my new banneton baskets and freshly milled flour made from white whole wheat berries. Sourdough bread whole wheat flours should be very fresh for the best results. For Whole wheat sourdough, fresh milled flour offer the finest properties for baking. Watch out for really old flour. Whole wheat flours quickly go rancid. Use your freshly milled grain for best results. Beginner Whole Wheat Artisan Sourdough Bread made with 100 percent White whole wheat flour in my new bannetons. Love those bannetons. They just the perfect size, light weight and easy to stack and set aside. I also love the option of removing the liner for this ridged artisan look. THEN read the printable recipe card. Still confused? Here is a complete step by step tutorial for you on this Tartine bread making method. NOW read the tips you’ll find below. They are specific to this recipe. If you are still confused about something please feel free to ask us. We are here to help you be a foodie success. I Promise you will delighted with yourself after mastering this recipe. Especially after you try a slice. It’s so good! Beginner Whole Wheat Artisan Sourdough Bread. Look at the shine on the scored areas. That’s a clue to you that the bread is done (or close to it). Scoring a big deal for one reason. Proper scoring helps the bread attain it’s optimal bread rise. This will give you the best crumb. Learn to score your bread properly and get better results at the table. It takes practice. Using whole wheat flour will make the stretch and fold process (I show it to you in the video) looks a bit different because the dough will be more resistant to stretching. That is why I also used the slap and fold in this recipe to relax the dough and get the gluten forming. Pick up your dough with one hand and let it hang in the air until it stretches a bit. NOW slap it on the counter. It should be a stretched out piece of sticky dough. Release it from your counter with the dough blade and fold it over. NOW Pick it back up by a different side and repeat until the dough has been counter slapped four times. This method WILL degass the dough somewhat which will give it the denser crumb you see pictured. But it’s a great way to develop gluten for a sandwich bread that you want a close crumb on anyway. Stick to the gentler stretch and fold if you want a highly aerated loaf with lots of artisan like holes. If the gluten does not develop(the bread is still breaking after four stretch and folds when gently pulled apart). Add another stretch and fold until you get a stretchy dough. The extra stretch and fold (or two) will help the gluten develop. To accommodate the heavier white whole wheat flour I added 50 grams of very active starter. This does help keep the dough more workable and give a pleasing finished crumb that is moist and flavorful. BUT this is designed for the white whole wheat flour and worked great. Beware too much liquid with the heavier winter wheat flours. Start with 200 grams of starter and see if that works best for you. If it’s too dry add the extra starter after you have mixed it at the autolyse stage. Beginner Whole Wheat Artisan Sourdough Bread-Sliced. Notice the aeration throughout the bread. But the holes are small because I degassed the loaves with the slap and fold technique. This makes a wonderful sandwich bread and toast! Measure your ingredients by WEIGHT. Flours especially need weight rather than volume measures for the most consistent results. I actually began measuring by weight when baking these breads. Here’s my G Dealer scale. It works great and it’s reasonably priced. Salt will have VERY different volumes depending on the variety of salt in your kitchen. I use sea salt for this recipe. You will need a dutch oven or other HIGH HEAT (to 500 degrees) oven safe skillet with a lid. Chad Robertson prefers a cast iron skillet combo. I use my Le Creuset oval Dutch oven (gifted to me by my Lovely In laws). I am SO happy I bought this dough scraper set. They are VERY helpful working with high hydration doughs. The bowl scraper is genius. This is a sticky dough and the bowl scraper (when wet) slides that dough around like a dream. Bannetons are for the final long rise often done in the fridge. They come with handy cloth liners that fit to help keep the dough well formed. The finished bread has lovely ridges in it. If you remove the cloth liners and heavily flour the baskets your loaf will look very artisan. A lame knife for scoring your loaves. Also really helpful in releasing the dough to rise properly. LET’S START WITH THE WILD YEAST STARTER. WHY WILD? Wild yeast starters provide a much Better, Fuller, more Complex….AMAZING flavor and texture than commercial yeasts can. 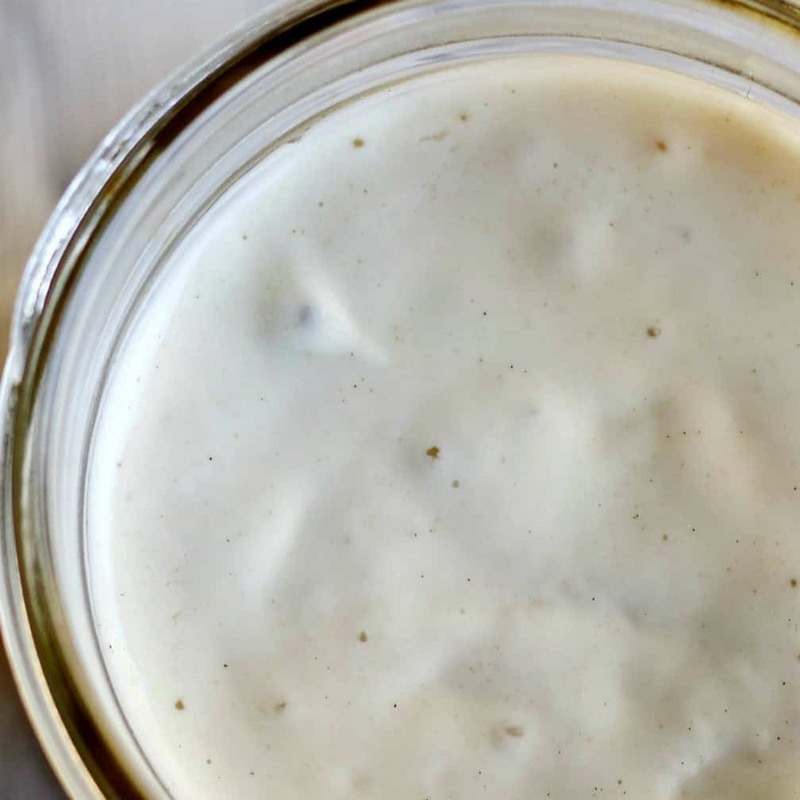 You can easily build your own wild yeast starter. But plan ahead. Give yourself about a week (maybe two for your first one) to get it ripe and bubbly. And all the sourdough discard you will create? I have lots of sourdough discard recipes in the works! NOTE: You can make your own starter from ANY flour you like. I have made starter from whole wheat flour and also rye flour. Eventually you will learn which starter you prefer. But they can be easily adjusted by simply starting with your established starter and adding whatever flour you prefer. 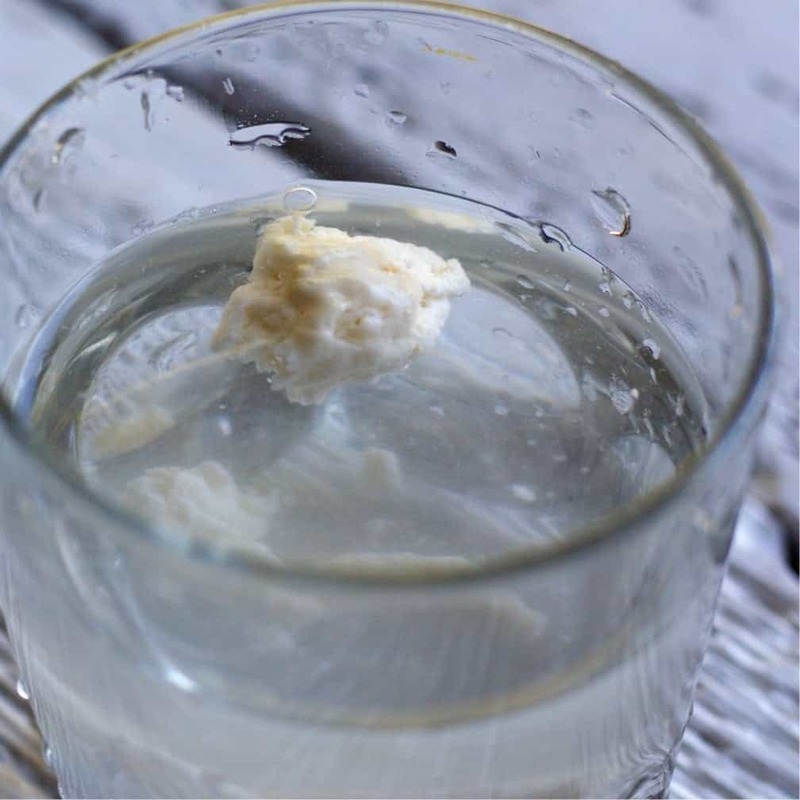 Go To this post on HOW TO MAKE WILD YEAST STARTER if you are just getting started with starter. After the starter is active like this one, it’s time to build the leaven for the bread. DO NOT begin your bread recipe until the active starter passes the float test. To test your starter drop one teaspoonful of it into a cup of tepid water. It should float like a superstar! No lazy barely lifting off the bottom. It should bounce right up and retain it’s form. If you DO have an inactive or lazy starter? FEED it. Feed it now and check it in a few hours. That may be all it needs. Otherwise feed it twice or even three times a day until it floats like it should. Sourdough Starter with 100% hydration made from all purpose bread flour. TIP: For this ancient method of Long cold rise bread baking (Made famous by Chad Robertson) you have control over the amount of time you develop the gluten in your bread. After 15 to 18 hours in the fridge take out the dough and look at it. It should be risen about 20 percent at least (it won’t rise as much as regular bread flour). Look at the dough pictured below after about 15 hours of rising in my fridge and a couple of hours on the counter to warm it up to room temperature. Notice the air bubbles and the sheen on it? That tells me the dough is developing and rising as it should. Time to divide the dough. Beginner Whole Wheat Artisan Sourdough Bread-ready to bench rest. Notice the air bubbles in the dough? The glistening surface? This dough is looking great! After the dough is divided it should look like this. It has body and structure from gluten development. The dough aeration is also evident. Time to bench rest. Bench resting means your room temperature dough is relaxing and continuing to build it’s structure for the final form and rise. If your dough is slack and won’t hold it’s shape it may need a second bench rest. Even cold raised for several more hours. OR it may mean it’s over proofed. If so it won’t form good loaves. But it makes great pizza. Your Printable Recipe card. I suggest for this lengthy recipe you print out the recipe and refer back to it while reading the post tips. 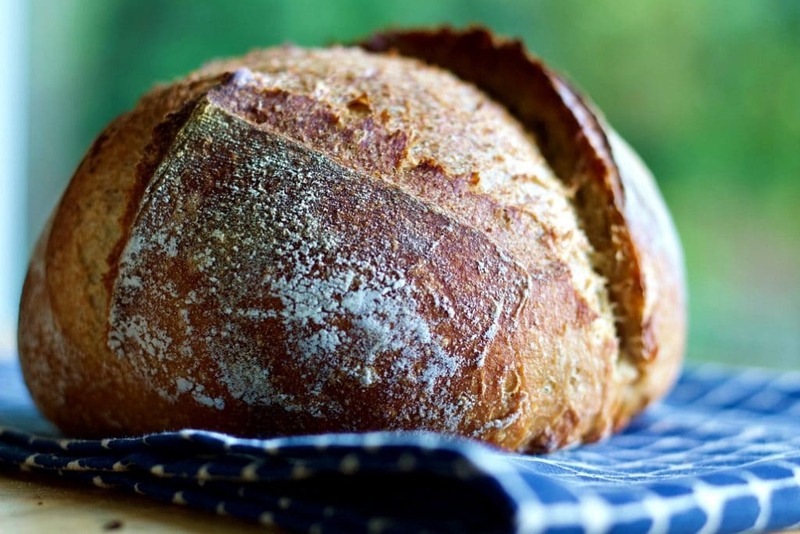 Make your own delicious bakery quality artisan sourdough breads at home. This recipe is a good start for new sourdough bakers. It's a long process but an easy one. These breads are so worth it! Add the flour to the leavened water and mix with the dough bowl scraper or other spatula. At the end use wet hands to form a shaggy dough ball. Let it rest (autolyse stage) about an hour. This stage can be extended without worry up to four hours at 75 degrees F.
Using your wet hands pull the dough from under the dough ball up and stretch it gently as you pull it over the dough ball top. Release. Repeat this process as you give the bowl quarter turns until the dough is stretched and pulled from each quarter of the bowl. (SEE video for a demo of this technique). Over the next 2 1/2 hours repeat the stretch and fold every 30 minutes. Whole wheat flour can be VERY resistant to this technique. If you prefer use the SLAP and FOLD technique. The dough should become an elastic resilient dough that passes the window pane test. BUT whole wheat flour may need more time in the stretch and fold(Or slap and fold) to build gluten sufficient to pass this test. Allow the dough to bulk rise IN THE BOWL at room temperature an hour or SO until it rises by 30 percent or so. Cover the bowl of dough with a plastic bag and set it in the fridge for 15 to 18 hours (Or overnight). It should continue to rise slowly so give it room in the bowl. Whole wheat flour will rise even more slowly than all purpose bread flours. 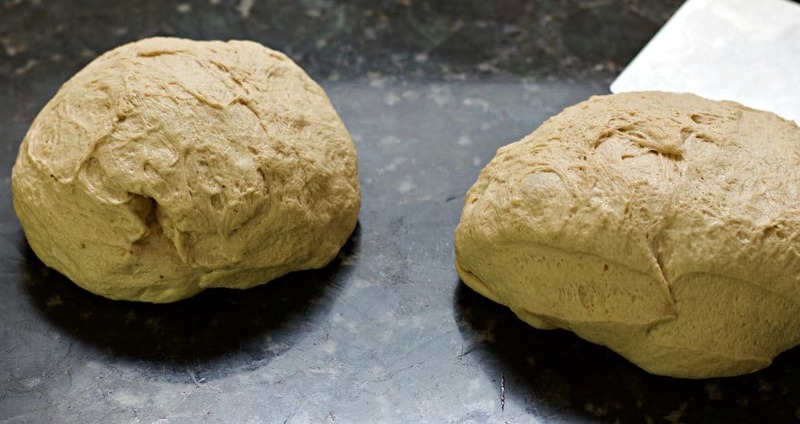 Remove the dough from the fridge and let it sit on the counter in the bowl for two hours or until the dough reaches room temperature (or pretty close). The dough will soften and gently rise (a tiny bit) and relax as it warms. On a clean unfloured counter pour out the dough into a large mass. Flour the top of the dough lightly but evenly. Divide the dough mass in half with your metal dough scraper. BEING CAREFUL NOT TO OVERWORK THE DOUGH-Form each half into a dough ball. The most efficient way to do this is to use the counter as your pivot point. Scrape in a circle around the dough (leave it unturned, flour side up). The unfloured counter will hold the dough center and create tension as you circle the dough with the scraper forming a ball. Repeat to form two dough balls. The DOUGH edge should be round and the dough ball should have some form and resilience to it. Let the dough balls rest for 30 minutes or so. They will spread out but should not fall off at the edge of the pancake. If they do, reform the loaves and bench rest them again to build the structure of the dough better. Gently slide the dough scraper under one of your dough balls and flip it over so it rests on the floured side. Now gently stretch and pull the dough over from the bottom to 1/3 up the loaf. Stretch and pull the dough from the sides to the dough middle. For the final stretch take the dough from the top of the ball and pull it all the way down to the bottom. Form a seam. Pinching the seam if necessary. Place the dough seam side up in your rice floured, cloth lined banneton or bowl. Rise in the fridge 2 to four hours until completely chilled. The loaves will not rise much at this point. Set a baking stone (if you have one) on your oven bottom rack. Set your dutch oven with it's lid on next rack up (lower third of oven). PREHEAT oven to 450 degrees F. for at least 30 minutes. Keep the formed loaf in your banneton in the fridge until you actually need to place it in your preheated dutch oven. Cold dough will aide the oven spring. (which means the loaves will rise better). Alternate method: Place high heat safe parchment paper over the banneton. Turn the banneton upside down so the dough falls gently onto the parchment paper. Now pick up the scored loaf with the edges of the parchment paper, if using, and gently and carefully place it into your VERY hot dutch oven. Put the lid on the dutch oven and return it covered to your preheated oven. Remove the dutch oven. Place the finished loaf on a cooling rack. Do NOT cut it for at least an hour to set the crumb. Return the dutch oven (with it's lid on) to the oven at 450 degrees F and preheat for 15 minutes. Repeat the process with the remaining loaf. To tell if your bread is properly done. It should sound hollow when thumped. The crust should look shiny and Caramelized at the scored sections. Whole wheat loafs are dense. The crumb may be open or closed depending on how you handled it. 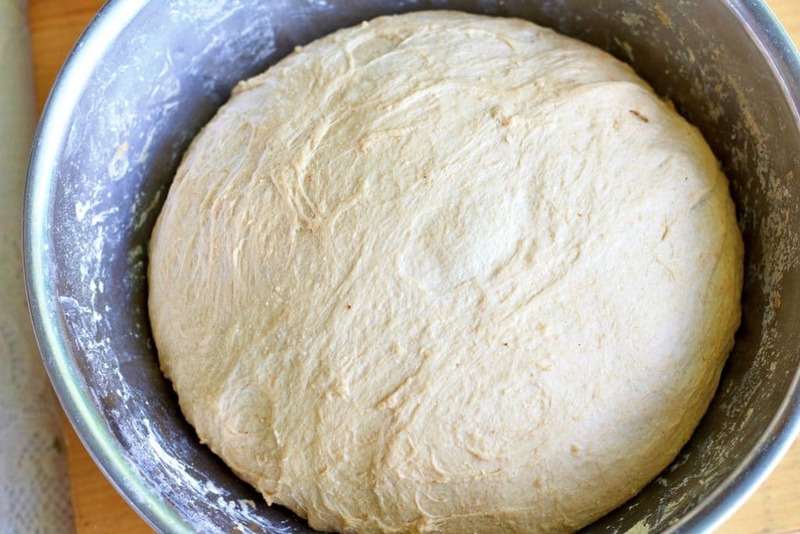 WATCH your dough as it goes through the stages of fermentation. 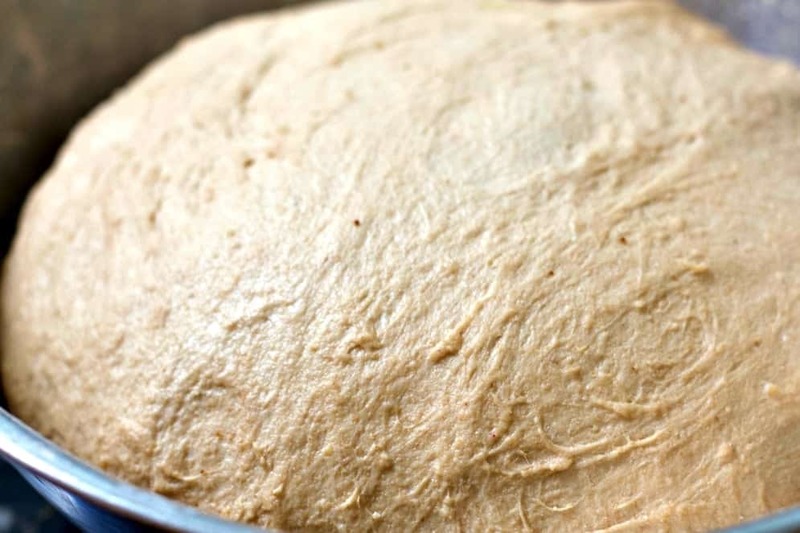 This dough can easily over ferment at high room (Or oven proofing) temperatures. 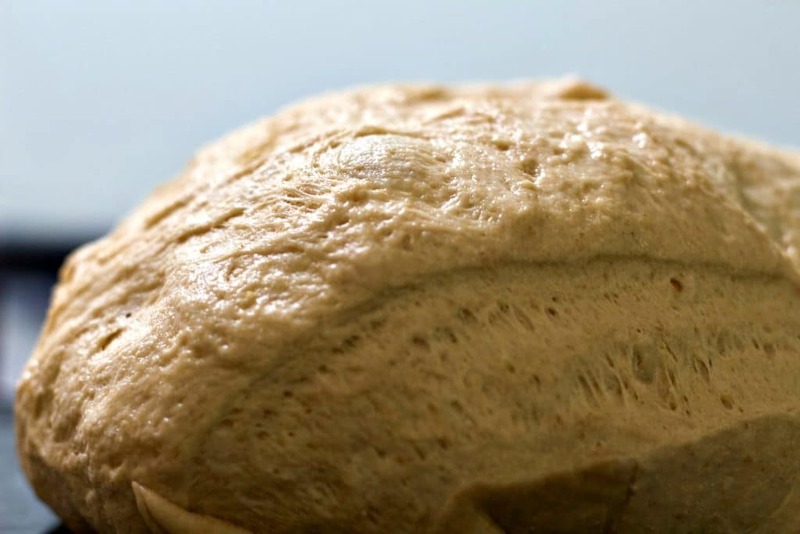 If your dough gets slack, unworkable and won't form or rise it is probably over fermented. At this point I suggest you Make pizza with it instead of loaf bread .To avoid over fermentation keep the room temperature (or oven) at 80 degrees or less. Whatever flour you are using will influence this process. Learn to work with the dough you are creating. This bread freezes VERY well. After it is completely cooled double wrap it tightly with plastic wrap and set in the freezer. Defrost at room temperature wrapped or unwrapped. Slice and eat. For best results store your sourdough bread loaves in a bread box (I use my dutch oven with the lid slightly cocked). That beautiful crunchy Sourdough crust gets soft in an airtight container or plastic sack. Once cut just set the bread cut side down to protect the crumb. These loaves hold very well for at least three days. Freeze the other finished loaf if you can't eat it right away. Banneton Tips: High Hydration dough tends TO STICK to the liner cloths and banneton ridges. Scrub rice flour into the cloth or banneton sides. Once the dough is in the banneton I add a bit more rice around the side of the loaf to keep it from sticking during the rise. IF your dough sticks a bit to the banneton cloth, use a sharp knife to pull it away and add some rice flour to the sticking spot. Now it should invert without too much trouble. For really tough sticks, cut the dough away from the cloth and repair it carefully by pressing the dough to reshape it before baking. Careful of burns if you are doing this in a hot pot. Don't despair. I have had some pretty mangled loaves come out of the oven beautifully! I’m SO happy you had great results with this whole wheat sourdough bread. The pizza stone helps to crisp the crust a bit in an open baked good like boules or pizza baked directly on it. For a dutch oven bread like this one it also crisps the crust a bit when the lid is open. In MY oven, which runs hot it also helps prevent over browning the bottom of the loaf. Hope this helps. Have a great day and thanks again for sharing your experience with this recipe. Please rate it too! Do you have any pointers for tweaking the flour ratio for people without a scale? I’m using kamut, and i think i didn’t get enough. My dough is pretty limp. I plan to increase it next time, but wonder what to look for to let me know i have enough before it’s too late to add more. Hi Julie, Ahhh. 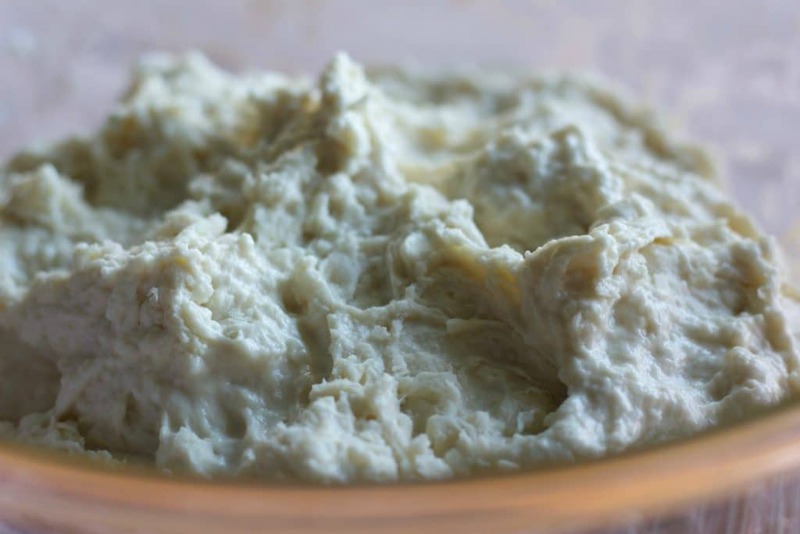 Kamut flour is very different from the all purpose flour called for in this recipe. I’m not sure how it’s going to work in this recipe. 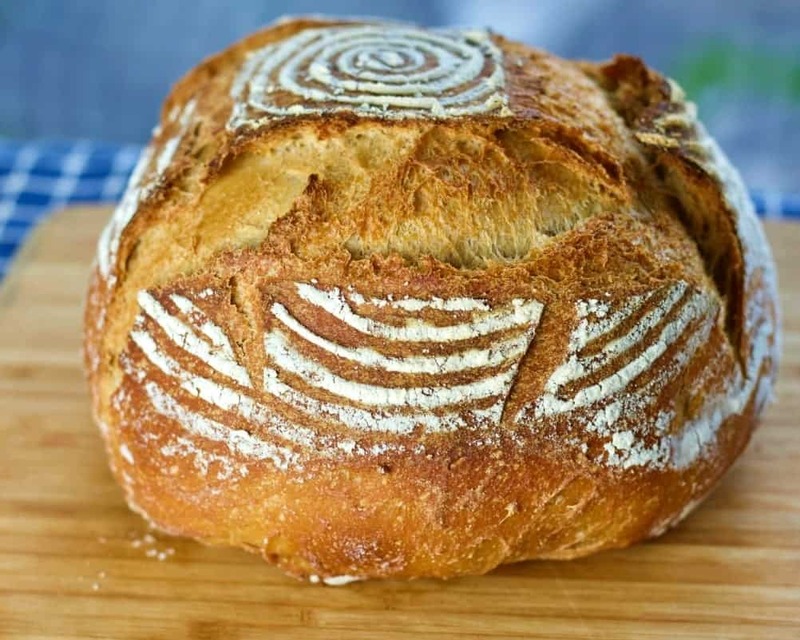 Here is a quick article from King Arthur flour on Kamut. IF you get the recipe through the stage and it just won’t rise I suggest you make it a pizza crust. It should be delicious. This recipe is not vetted for kamut so I don’t hold much hope for its success. Please let me know how it goes or you. All the best! Sorry I missed that you were making the whole wheat recipe. I’m still sure the kamut will have trouble with the rise. Good luck! I have never made bread before (aside from pizza crust) and am trying this for the first time. So i am a completely new to bread. Pretty sure i got the measurements right but the dough seemed dry and stiff. Not wet and shaggy as the video shows. I am using whole wheat white. Any suggestions? Thank you! Hi Tatiana, The video is for the process and technique. The actual recipe the video demonstrates is our all purpose beginner sourdough bread. If you follow the whole wheat recipe exactly you should have good results. HOWEVER, Whole wheat flour is much more dense and resistant than all purpose. And it yields a denser loaf. But deliciously flavorful. I recommend extending the autolyze stage to see if that helps loosen the dough. Gluten development will help soften the dough. It will get stretchier and it developed through the process. If you get to the slap and fold stage and the dough will not fold over well, here’s a tip. SLAP it hard on the counter instead of trying to stretch it.. Just pick the dough up by the end and throw it down on the counter while holding the end. That will help loosen the gluten strands for you. Slap it and stretch and repeat four times like you see the stretch and fold done. Wait the 30 minutes and slap it again. Repeat. By the fourth time the gluten should be developing which will loosen the loaf. Repeat until the window pane test is passed and follow the recipe as directed. Best of luck! Please let us know how this goes for you. We are here to help if you have any more questions along the way. Turned out absolutely delicious. My husband loved it. Thank you for the tips and recipe! Merry Christmas and Happy Holidays to you too! I’m so happy it worked well for you! Thanks for letting us know 🙂 You should feel very proud of accomplishing this. Your bread baking is off to a great start! Hi Cathy, I am SO EXCITED for you! Please let me know if you need help. And I’d love to see your results. Tag me with a picture in either our instagram or FB account please. Best of luck! Thank you so much for this wonderful beginner’s sourdough recipe! I have used it several times and although it tasted great, it would not rise much and was dense. Seems my starter was not mature enough but tonight I got amazing results. It is everything it should be: has holes, is creamy and has a beautiful crust. Your recipe is great and the video makes it so much easier to follow. Hi Maria, I had a similar journey into my first perfect sourdough loaf. I also discovered the starter has a LOT to do with a successful rise in sourdough. Thank you for sharing what worked for you. I’m so glad you found this post, recipe and video helpful!